Newton's first law of motion essentially states that a point object subject to zero net external force moves in a straight line with a constant speed (i.e., it does not accelerate). However, this is only true in special frames of reference called inertial frames. Indeed, we can think of Newton's first law as the definition of an inertial frame. 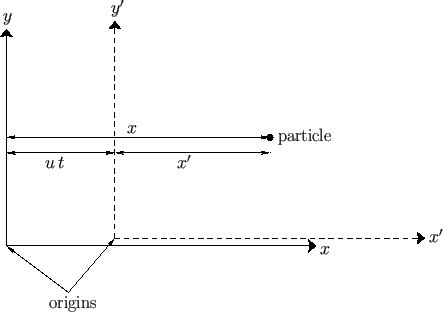 Thus, an inertial frame of reference is one in which a point object subject to zero net external force moves in a straight line with constant speed. This coordinate transformation was first discovered (implicitly) by Galileo Galilei (1564-1642), and is nowadays known as a Galilean transformation in his honor. Figure 2.1: A Galilean coordinate transformation. According to Equations (2.7) and (2.11), if an object moves in a straight line with a constant speed in our original inertial frame (i.e., if ) then it also moves in a (different) straight line with a (different) constant speed in the second frame of reference (i.e., ). Hence, we conclude that the second frame of reference is also an inertial frame. A simple extension of the preceding argument allows us to conclude that there exists an infinite number of different inertial frames moving with constant velocities with respect to one another. Newton thought that one of these inertial frames was special and defined an absolute standard of rest: that is, a static object in this frame was in a state of absolute rest. However, Einstein showed that this is not the case. In fact, there is no absolute standard of rest, which implies that all motion is relative--hence, the name ``relativity'' for Einstein's theory. Consequently, one inertial frame is just as good as another as far as Newtonian mechanics is concerned. where is the instantaneous velocity of the second frame with respect to the first. According to this formula, if an object moves in a straight line with a constant speed in the first frame (i.e., if ) then it does not move in a straight line with a constant speed in the second frame (i.e., ). Hence, if the first frame is an inertial frame then the second is not. A simple extension of the preceding argument allows us to conclude that any frame of reference that accelerates with respect to a given inertial frame is not itself an inertial frame.